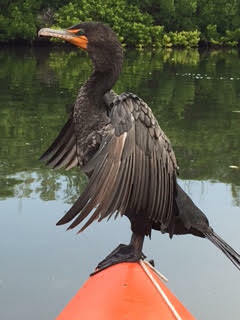 On a recent paddle through the Mangrove Tunnels, a cormorant hopped on Cindy’s boat to hitch a ride. When it was dislodged in a tight tunnel passage, it followed her to the open bayou and hopped back on again. Amazing!! 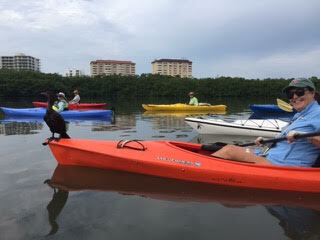 We gather for a group paddle once a month. We call ourselves DUUKS (Dedicated UU Kayakers). Most of us have our own boats. Rentals available at some launch sites. Easy-to-moderate flat water paddling. Emphasis is nature observation and conversation, not exercise. We meet on the 3rd Monday of each month (usually), 9:30 – 12noon, and lunch afterward.